After Damnation Books picked up Stricken, I felt halfway decent about my own writing for once. It was June, everything was signed and things were looking up. This is probably what attributed mainly to the writing spree I went on. For most of June and July, I sat down and wrote. A lot. More so than I ever had before in my life, as far as I can remember. And, at the time, I felt good about it. Amongst all the things I spit out were two novellas, a tragedy and a romance/paranormal/horror. I thought they were publishable. And then my wife got hold of them. My wife is a grammar Nazi to a T and worked in a library for five years straight. (Can you see why I married her?) She knows books, she’s intimately familiar with how a story should flow and how to judge a book by its cover. She offers an excellent balance of both literary criticism and the mechanics of grammar. On top of all that, she is entirely unafraid to tell me what she really thinks with a complete and total disregard for my feelings. Obviously, this is a good thing, since we can learn more from criticism than we can from praise. She told me both of them were pretty far from being ready for people to shell out money for, even just a few bucks. Naturally, I didn’t take well to this, but eventually I realized she was right. It took me about a month and a half to get back up and try writing something else. This time around, I took more time and focused harder on the writing. From a strange cocktail of inspirations, Liberation Road was born. It starts out with a twenty something heading across the vast, boring plains of Kansas, on his way to meet his online girlfriend for the first time. Naturally, he’s nervous. Then he starts running low on gas. Forced to pull in to an isolated gas station, nervous tension quickly turns to genuine fear when he can’t find a single soul. What started out as a simple pit stop morphs into a grim tale of survival when his car dies and something entirely inhuman beings hunting him. 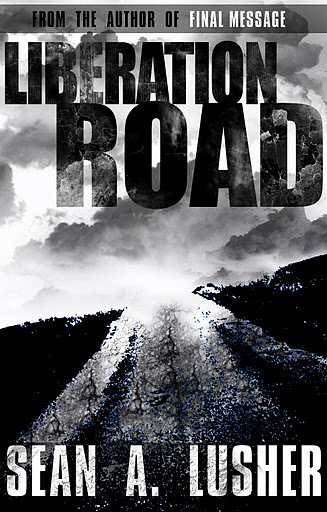 Liberation Road is a twenty two thousand word Horror/Mystery novella that I self published on the Amazon Kindle. My main inspiration for writing this was frustration at a lack of quality monster fiction in several media avenues. Be it books or movies or video games, horror is an underrated genre. What’s worse, most of the horror that is out there nowadays concerns a human element: the psycho stalker, the serial killer, the crazy hillbillies. And even of the few horror pieces out there that do have an inhuman antagonist, they typically fall into the ‘safe zones’: zombies, vampires, werewolves, demons. I wanted something different. I wanted something that didn’t fit into the rigidly defined notions of what a ‘monster’ is. Coincidentally, that’s the same reason I wrote Stricken. It’s going to serve as the inspiration for future works. Which reminds me, what am I doing next? Of course, I’m completely contradicting myself and writing about zombies in a Sci-Fi setting.